Action! Saint James tells us that we must demonstrate our faith with actions. As Catholics, that means taking up our crosses and following the Lord. “Faith of itself, without works, is dead,” James says (2:17). His teaching comes directly from the Lord. This month during daily Masses we hear from the Letter of Saint James (AD 60). James is the first of seven catholic, or universal, epistles in the New Testament and was written by “the brother of the Lord,” (Gal 1:19) who led the Jerusalem Church. James was not one of the Twelve but a close family member of Jesus (see Mk 6:3), and his letter has been called “New Testament wisdom literature” because the prose is inflected with the tone of wisdom literature, as found in Proverbs, Sirach, and Ecclesiastes. “Blessed is the man who perseveres in temptation, for when he has been proved he will receive the crown of life that he promised to those who love him” (Jas 1:12). James also is constructed around themes from Jesus in his Sermon on the Mount, especially the Beatitudes. As Lent approaches we must prepare ourselves for the focused, intense period of spiritual immolation that comes with discipleship. The letter is good preparation leading through these first seven weeks of Ordinary Time. James’s advice is acerbic but practical and for one willing to take up the cross of discipleship as interpreted by an apostle (for that is what Paul believed James to be) a key piece of writing that informs faith and motivates the reader to action. Discipleship void of the cross is armchair theologizing. Crosses get moved by mind and matter. James writes of the value of trials and temptations, the power of prayer, the efficacy of the sacraments, and warns against hypocrisy and the unbridled tongue. Our Christian journey begins at baptism, which brings benefits but also responsibilities. We become priests, prophets, and kings. We are priestly because we worship God. We are prophets because we proclaim the Word by what we do and say. And we are kingly because of the kingdom we inherit when we die. As Christians, our words and actions must be consistent. This comes through Saint James but directly from the Law and from the Lord: Faith without works is dead. James suffered martyrdom by stoning under Herod Antipas in AD 62. Make your actions consistent with your words. Show no partiality toward anyone. Beware the dangers caused by an ungovernable tongue. To do otherwise makes one an “ignoramus,” says James. To claim to know Christ but to not listen to his words is dishonest. To profess him as Lord but not do what he says is hypocritical. What profit is there for one to gain the world but forfeit his life? As a royal people, eternal life is our inheritance, but only if we proclaim the Good News and take up our crosses. 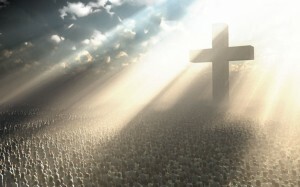 The cross is the key that unlocks the gate of heaven. We have been given that key. I am living moments of intense trial and your article was really uplifting. Just wanted to let you know.